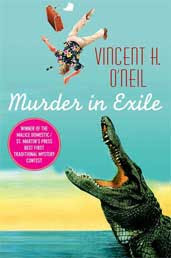 MY BOOK, THE MOVIE: Vincent H. O’Neil's "Exile Trust"
Vincent O’Neil won the St. Martin’s Press “Malice Domestic” award in 2005 with his debut novel Murder in Exile. The “Exile” series consists of Murder in Exile, Reduced Circumstances, and Exile Trust. Exile Trust was also published as a large-print book by Thorndike Press, and will be released in early 2010 as a paperback in Harlequin’s new “Worldwide Mystery” imprint. His short story “Finish the Job” was selected for the anthology Quarry: Crime Stories by New England Writers (Level Best Books, November 2009) and another of his short stories, “Blood Tells” will appear in the anthology Bad Cop ... No Donut (Padwolf, 2010). A pair of book reviews first prompted me to think about the possible casting of my “Exile” mystery novels. Both reviews covered the first book in the series, Murder in Exile, each in a different way. One observed that my main character, background checker Frank Cole, had Jim Rockford’s wisecracking good nature while another said Frank’s unbending loyalty conjured up memories of Thomas Magnum. As The Rockford Files and Magnum, PI are among my all-time favorite shows, this made me ponder who might play Frank and his friends if the “Exile” series ever made it to TV or the big screen. Frank is a low-key guy, early thirties and quite bright. At the beginning of the series he relocates to the small town of Exile, Florida to restart his life after a disastrous business bankruptcy. His new job as a background checker is what pulls him into murder investigations—making Frank a reluctant amateur sleuth. He’s dogged in his approach and not afraid to make mistakes, but he’s more brains than brawn when it comes to fisticuffs or gunfights. With all that in mind, I soon decided on Noah Wyle of the hit TV series ER (and many other endeavors) for the starring role. The actor playing Frank Cole has to demonstrate a self-deprecating intelligence backed up by stubborn determination and a good sense of humor. Noah Wyle has covered all those bases in his career, and he possesses one of Frank’s most important attributes: People just plain like him. Frank is alone in Exile at first, but he soon finds a girlfriend in photographer Beth Ann Thibedault. She’s much more confident than Frank and tries to steer him in the right direction in the series’ second book, Reduced Circumstances. Those qualities made me think of Maggie Gyllenhaal, the smart prosecutor who gives tough love to Bruce Wayne in The Dark Knight. Although that role qualified her to play Beth Ann all by itself, her performance in the literary-themed Stranger Than Fiction showed that she can also play the tender, nurturing partner that Frank needs as he tries to rebuild his life. Frank’s best friend in Exile is a local retiree named Gray Toliver, a sarcastic know-it-all who would be annoying if he didn’t actually know it all. Gray acts as a sounding board for Frank’s early cases, but has to take over one of his investigations in the series’ third book, Exile Trust. Envisioning a crusty-yet-supportive actor for this role brought up one of my personal favorites, Robert Loggia. Blending two of his previous roles, that of Al Pacino’s doomed criminal mentor in Scarface and Hector Elizondo’s cagey assistant coach in Necessary Roughness would create a very close approximation of Gray Toliver. Loggia is the caliber of actor who can tell Frank he’s a naïve fool while in the same breath expressing complete confidence in his ability to get the job done—and that’s what Gray does best. Last but not least, Exile’s chief of police is a brilliant small-town cop named Denny Dannon. Provided someone could pry him away from his outstanding spot on CSI, that role would have to go to the inimitable Laurence Fishburne. As Exile’s de facto mayor and guardian angel, Chief Dannon commands respect with just a look—and we all know Laurence Fishburne can do that. An excellent cast for a great series. Anybody got their numbers? 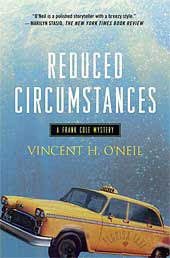 Read sample chapters and discover other information about the books and author at Vincent H. O’Neil's website, www.vincenthoneil.com. The Page 69 Test: Exile Trust.